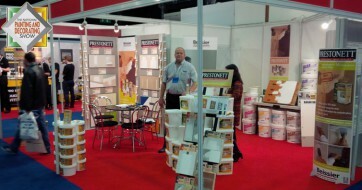 The Fine Surface Filler is available in 1 kg pot. 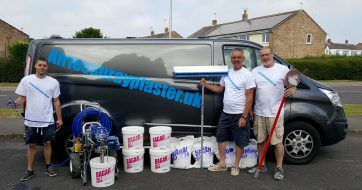 Rob & Lee Rowland, Spray Plaster Contractors from the Bristol & Bath area have just completed renovation project using Bagar Airliss G and this is what they had to say……. .
« Although we have been plastering for over thirty years finding airless spray plaster is a new beginning it is the future of internal plastering. 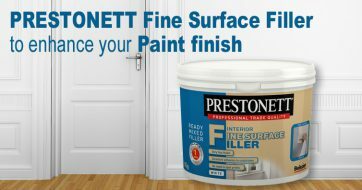 We have now completed various jobs around the Bristol and Bath area and have found once are clients see how the airless works the speed and the finish being so white they love it (video). « Bag in Bag » for the Professional Trade. 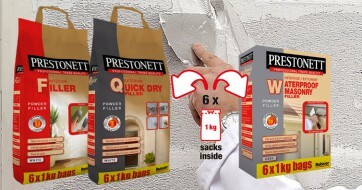 For a professional finish, PRESTONETT is now available, in a 6 x 1 kg multipack !